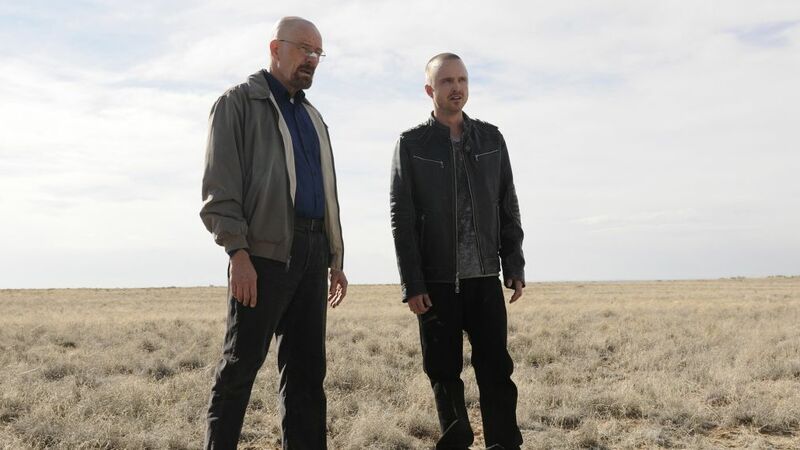 Fans of Breaking Bad rejoice because the gang is getting back together! Five years after the finale, and 10 years since the premiere, the cast of AMC's hit series is coming together for a special reunion event at this year's San Diego Comic-Con 2018. Set to take place July 19, the reunion will coincide with the presentation for spinoff series Better Call Saul, which will share its Season 4 premiere episode. According to Deadline, Walter White actor Bryan Cranston and fellow stars Aaron Paul, Anna Gunn, Dean Norris, Bob Odenkirk, Giancarlo Esposito, Jonathan Banks, Betsy Brandt, and RJ Mitte, will join creator Vince Gilligan for a session beginning at 4:30 PT. The reunion will take place after Better Call Saul's presentation, taking place in Hall H at 3:30 PT. That panel will feature Odenkirk, Banks, and Esposito as well as Rhea Seehorn, Michael Mando, and Patrick Fabian with Gilligan and co-creator Peter Gould. This won't be Breaking Bad's first time at SDCC. They often made appearances during its Emmy-winning television run, but it's been five years since they last appeared at the convention. SDCC will run from July 19-22.